Two decades ago, Jana took me to many amazing places, and that must have been an easy thing to do. You see, I wasn’t used to amazing places (the Netherlands has very few), and Slovenia is full of them. I wanted to see everything, and I am still not finished with that. Most of all, I wanted to see reptiles. One day, in a small valley near a stream, I caught a small lizard. I thought that it was a wall lizard, which is a common species, and I put it on a small pile of rocks in the stream to take pictures. I figured that I had it well under control, but I was wrong. After I took some pictures, it was gone. On the way home, it kept nagging at me. Something didn’t quite fit. Still, according to the then known distribution of lizards, it could not have been anything else than a wall lizard. Or could it? Theoretically, there was another possibility: Horvath’s rock lizard. This species was known from opposite corners of the country, but not at all from the region where I had been. I checked my pictures: it could be. At a herpetological meeting, I asked Katja (a leading Slovenian field herpetologist) where I could see rock lizards. She send me to a castle ruin high up in the mountains. And, sure enough, there were rock lizards. And then I had even more doubts about my finding near the stream. The lizards did not make themselves easy to find. We went back to that stream, several times. The valley is steep and there is sun for just a few hours each day. It is also relatively cold. Lizards need sun and warmth to become active, and every time we were there, the circumstances weren’t exactly right. We found young Grayling (a fish) and even the rare Burbot (another fish), but no lizards. Nevertheless, the place is incredibly nice, quiet with a pile of rocks which are the leftovers of an ancient saw-mill. Just a few meters upstream, the entire stream comes out of a big cave. In the cave entrance, Grey Wagtails are nesting and occasionally Dippers perch on rocks in the streambed. Winter came, and winter is the wrong time to find warmth-loving lizards. Only in the next spring, I saw a lizard again at the same place. Now, I had no doubt: this was not a common Wall Lizard. It was Horvath’s Rock Lizard. This finding was an entirely new location for the species, in a region where no-one expected it. I am sure that other herpetologists had visited the place before me, and, probably, they had also seen lizards. But, like me, they never expected this species here, and they must have thought that it was just a Wall Lizard. Later, colleagues confirmed our finding and even found other new localities in the same region. Back home I looked at my slides. I knew I had photographed Horvath’s Rock Lizard twice at the exact same place. But, was this the only reason why the lizard had looked so familiar? Individual lizards differ from each other in their colour pattern, in the same way as human faces differ. Their scales are as different as our fingerprints. And these characteristics stay throughout a lizards’ life. I noticed that the lizard on my colour slides had a roundish brown spot on it’s back, which was easy to recognise. When I looked at my slides from the previous year, I saw the same spot! I had not only found the same species in the same place, I had found the exact same individual lizard again, one year later! 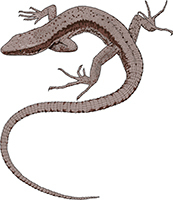 Horvath’s Rock Lizards remain difficult to find in Inner Carniola. We now know of a few populations, but all these populations are small. They live in places which have only a few hours of sunlight each day. Seeing them might mean going numerous times to the same place. They live in nice areas, but it takes time. On our Amphibian, Reptile and Freshwater Fish Study Tour, we will pass one of these locations and if the weather is right, we will stop for sure. But, we may have a better chance in another part of the country, which we will also visit. I don’t dare to promise that we see this species for sure, but we will certainly try.